Police have begun handing out fines of up to €300 to people drinking alcohol on the streets around Place Flagey after midnight. The late-night drinking ban was moved forward from 2.00 in the morning since 15 March and RTBF reports that the first police checks were carried out on Friday night. Officers spent several hours giving warnings to people and raising awareness of the new rules before proceeding to issue fines later in the night. The ban from midnight to 8.00 applies from 15 March to 15 October around the Ixelles ponds, Place Sainte-Croix and Rue de Belvédère, behind the Flagey building. In the winter, the restrictions apply from 2.00-8.00. 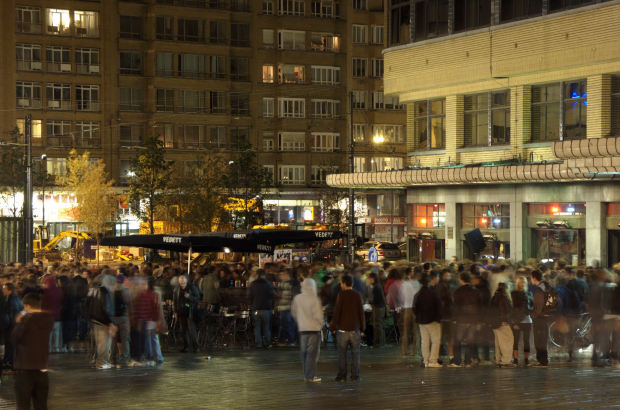 Public disorder, noise and dirtiness remain a major concern for people living around Flagey, who had asked Ixelles mayor Dominique Dufourny to take tougher action. Thinly veiled racism has no place on the end of an article like that. Go back to wherever you came from if you can’t handle Moroccan weddings ffs. Telling someone to "go back to wherever you came from" is something a xenophobe would typically write. How do you know he/she is not from Belgium.